There are few names in the 'indie gaming' crowd that draw as much attention as Jason Rohrer. Though he may not be widely known amongst the gaming public at large, for a man from up state New York who spends a good portion of his time programming amidst verdant meadows and volunteering his time at a local food co-op, he's pretty renowned amongst his slice of game enthusiasts. Frequent panelist at development conferences and winner of an Independent Games Festival Innovation Award for Between, Rohrer has been marked as one of the most influential minds in game development, all because his simple pixelated creations trigger rare and profound sensations. Once again I bend the Sensationalist rules by discussing the collective work of one individual, not because they share a theme, but because the methods are similar and effective. Considering his spartan game design, it almost seems as if Rohrer's work is a phenomenon. After all, how could so few polygons elicit so much thought? Why do so many of those who play Rohrer's games express genuine emotions? Part of the answer is as simple his games: because he asks us to. None of Rohrer's works are visually mind-blowing or particularly complex. 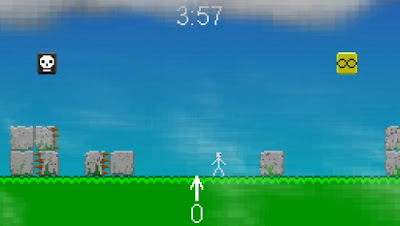 Immortality is essentially a block stacking game, Gravitation a vertical platformer, Regret a memory puzzle. At its most basic, Passage is played by simply moving your character from left to right. It is their subject matter that deepens the experience. Let's begin with an example. Immortality is a thought experiment. Above your avatar a clock counts down your imminent demise. Hovering in the sky are two icons, one symbolizing death and one appropriately symbolizing immortality. The goal, if you were to arbitrarily create one, might be to stack blocks to reach one of these icons. Rohrer boils down distractions to leave only the basic mechanic of jumping and moving blocks, placing the importance on your decision. When given the opportunity, would you live forever? My answer was an unashamed yes. Upon reaching immortality the clock and the icons disappear. It is in that singular moment the game takes on meaning. The game has no purpose without goals to reach, only curiosity about death remains. By extension,Rohrer asks the player to reexamine their perceptions on the value of death (and life without it). Most of Rohrer's games are empowered with these moments of self-reflection. The entertaining puzzle mechanic of Perfectionism is given new meaning when, upon completion, your score is ranked number one above "nobody". A nice transition between a sense of pressure to excel and shame of realizing it doesn't matter in the slightest. The shame of Regret strikes when, after feeling so secure in your knowledge of which animals feed on which food item, you accidentally kill one, creating a ghost that will haunt your little avatar later in the game. Similarly, the sense of loneliness in Gravitation occurs when, after empowered by a companion to soar to great heights, you come down to find her missing, with only a dwindling fire to keep you company. Idealism, Perfectionism, Police Brutality, and others do not elicit an emotional response independent of their subject matter. In fact, these games are quite similar to others that have come before it. It's not the lines and squares of Perfectionism's puzzles that foster interaction with the game's themes, it's the fact the very title asks us to keep these questions in mind. 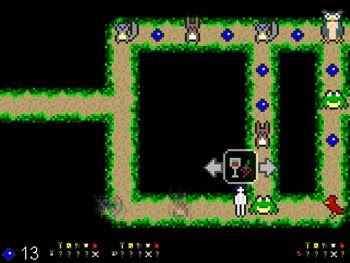 For Rohrer , the existence of meaningful games is taken as a given. To expect his players to engage with these thoughts and emotions through play is a brave decision and a powerful statement on game design. All this is not to say these games are only successful because we want them to be, there is talent in their design. Between (one game I was unable to play), explores isolation and cooperative behavior by necessitating another players involvement. Cultivation, on the other hand, tackles issues of social cooperation by incorporating the results of selfish interest into its design. Passage, perhaps the most played of Rohrer's games, elicits sincere emotion with simple design to surprising effect. Passage is about life, death, aging, loss, and companionship all told by moving an avatar from left to right. A hazy future gives way to memories as my avatar noticeably ages with his companion. Again, the moment of profundity occurs when my companion dies, leaving a tombstone to mark her passage. It was here I let my character sit idly, pondering my own thoughts on mortality. And then, with the baggage of loss, my avatar and I moved on, the former dying shortly after. Unlike the other Sensationalist games we've discussed, Rohrer asks us to reexamine the game we are playing to find emotions, concerns, and perplexing thoughts that we already have. Loss, loneliness, fear, joy are all universal, complex, and vague. These games leaves them that way. Passage is not sad (or happy) because one specific character underwent a very specific journey, but because we recognize we too must follow this path. The sensations it elicits are sensations we are familiar if not comfortable with. By squeezing these complex emotions into tiny pixels, he asks us to examine the weight of these sensations. In doing so, the games of Jason Rohrer proves what many gamers already believe: that the sensational storytelling potential of videogames is endlessly expansive.